Your plants need protection in order to grow healthy. The first thing you can do to preserve your plants is to protect them from outside threats. And that’s why you need a backpack sprayer. The backpack sprayer will enable you to dispense pest and weed killing solutions fast. On top of that, the best backpack sprayers will help ensure that you get the best results. The featured backpack sprayers in this list are among the best products that are user-friendly and powerful. Our tips on how to choose the best backpack sprayer will help you choose the right brand for your needs. The Field King Professional S-2190328 is #1 on our list because of its awesome features and efficiency. The backpack features a four-gallon capacity, as well as a pressure regulator that lets it spray 25 psi continuously and a pump that can offer 150 psi of spraying, which makes the sprayer the perfect choice for small or medium-sized properties. 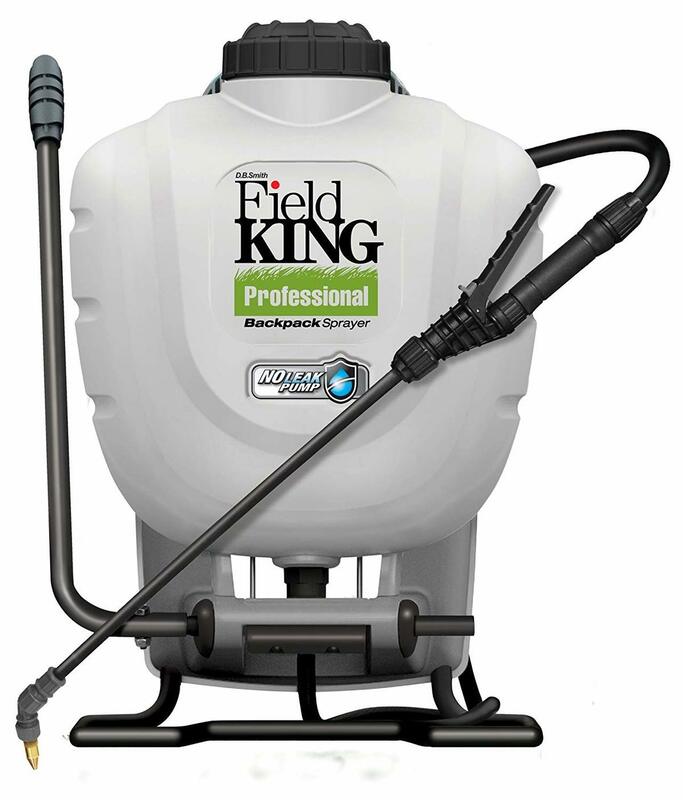 Whether you’re spraying your fruit trees getting or rid of weeds, the Field King can compete with other diaphragm or piston backpack sprayers. Its internal pressure chamber can produce a spray that reaches a maximum of 20 feet, and its built-in agitator can deal with various kinds of powders, liquids, as well as water-soluble solutions, whereas its internal paddles guarantee that the liquid is mixed well and all set for spraying. This backpack sprayer is built with brass inner parts, robust plastic tank, as well as a 21-inch poly wand that’s made with top-quality Viton seals, designed for damage resistance from harsh chemicals. It has four different kinds of nozzles to pick from depending on the spraying use: 2 flat fan nozzles, a foaming nozzle, and an adjustable brass nozzle. Moreover, the pump action works quite well in creating precise spray patterns from the poly wand. Its comfort grip also makes it ergonomic for when you’re working in tight spaces or difficult-to-reach places. Also, its handle can be changed for right-handed or left-handed use, and its built-in handle makes it easy to store or carry around. Though it is one of the heaviest sprayers at 13.15 lbs., the Field King is arguably the most comfortable and easiest sprayers to utilize. It features an adjustable shoulder strap padded for your comfort. Furthermore, the waist belt and cinch and chest strap are padded. The sprayer includes a huge tank as well as a filtration basket that keeps out debris and large particles while you fill it, and its one-way valve aids you to prevent spills once the task is inverted. The My 4 Sons M4 Sprayer contains a 0 - 60 PSI pressurized pump with adjustable output, long-lasting battery, adjustable want, adjustable brass nozzle, and many more. The unit can deliver at least 30 feet of spray in different patterns, shifting from long distance to fine mist depending on the trigger pressure. This 4-gallon backpack sprayer comes with a battery that enables it to spray for eight hours straight with just one battery charge. Battery-life indicator lights will inform you of whether or not you’ve got a complete charge within that period. Although the manufacturer mentioned that the sprayer has a wide opening, I thought it was a bit small for my type. But it has a screen filter to keep all dirt and debris out which is great. The tool contains an ergonomically designed locking trigger and adjustable curved steel wand for smooth and precise spraying. Powerful should strap bolted towards the sprayer prevents any disconnection or dropping. The product utilizes fused battery terminals over screws, and hose connections over hose clamps, minimizing any leakage from the tank. It contains a voltage meter and 4 nozzles – fine mist, double, adjustable brass, and flat tee jet. 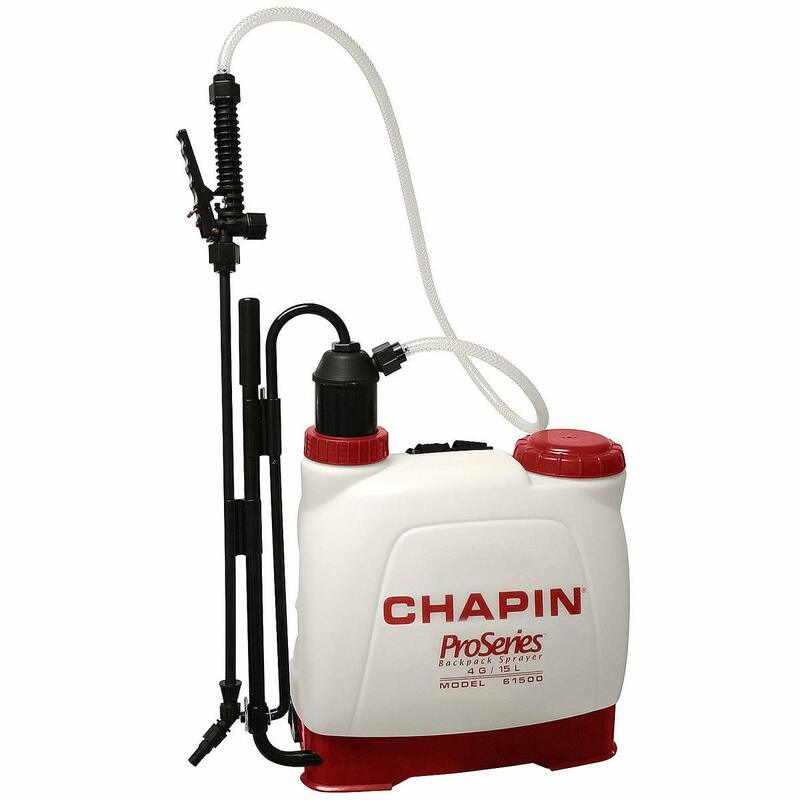 If you have to maintain your lawn or clear your home or garden from unwanted pests, Chapin sprayer will definitely save money, time, and effort. The product features a decently-sized four-gallon tank, a reliable 20-v lithium-ion battery from BLACK+DECKER that will give you approximately 1.75 hours of constant spraying as well as 50 gallons of your sprat prior to recharging the battery, and with a pressure of 35 to 40 psi. The Chapin can also produce a huge six-inch mouth opening, which is easy to fill, with its carrying handle built into the cap. Its cushioned grip shut-off includes a built-in, functional filter, which ensures that debris cannot clog the nozzle. Since a strong battery powers the sprayer, you don’t need to pump the unit constantly to acquire the desired pressure, and its deluxe padded shoulder straps even make the product comfy to use. 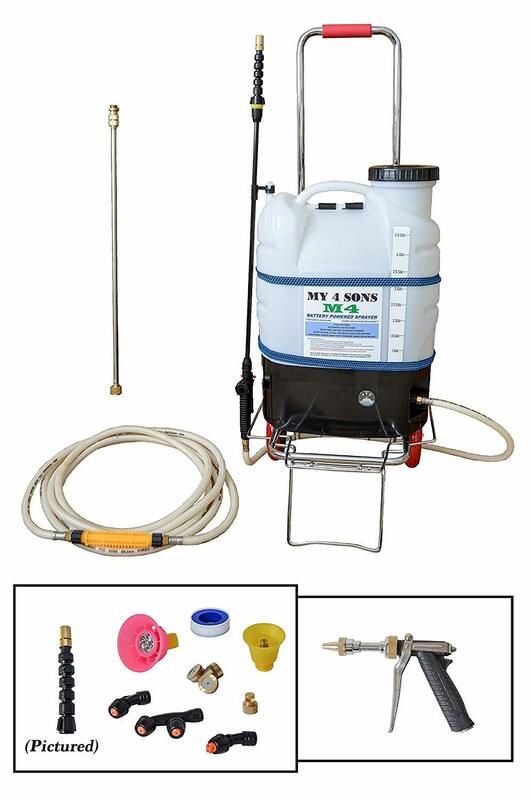 This sprayer is compatible with several common weed killers, pesticides, and fertilizers. If you happen to have a big lawn or garden to maintain, then the Smith Performance Backpack Sprayer is for you. It has a four-gallon tank, and it can pump out 150 psi. Your gardening job will be finished fast and effectively with this top-level comfort and performance. Smith has created this powerful and durable sprayer from first-class materials: powerful internal piston pump, a contoured tank, a 21-inch poly-lined stainless steel wand, stainless tank frame, and 50-inch chemical-resistant poly hose. 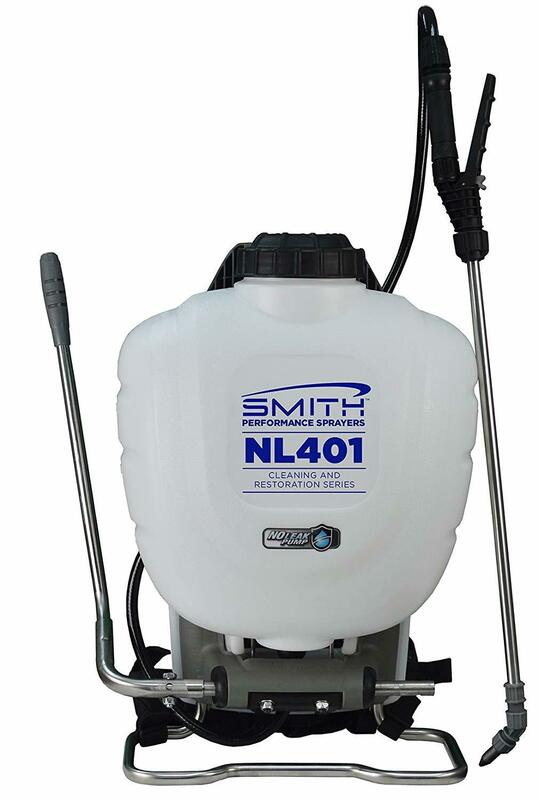 The Smith Performance Backpack Sprayer features a finely tuned, mixing action along with a built-in agitator, which can handle water-soluble solutions, liquids, and powders; these will ensure that the liquid is all set to be sprayed whenever you wish. Its robust gaskets and Viton seals throughout the wand and pump guarantee that you won’t experience any leaks. This highly efficient sprayer can get 65% of high pressure compared to the top diaphragm pump backpacks. Its patented pump design indicates that the spray can aim areas that are hard to reach, and make more precise patterns for equal coverage. The product is comfortable to use and wear as well. It features supportive straps as well as a breathable, full-cover, padded ballistic nylon harness, which aids you to distribute your unit’s weight evenly across your shoulders to provide you with much lumbar support. It also has numerous nozzles that can provide you with various kinds of spray action: flat and wide fan, an especially patented, high-foaming nozzle, as well as an adjustable brass nozzle. The wand also accepts TeeJet nozzles. The handle features a shut-off locking system when you don’t have to make use of the spray and its included, foldable carry handle. The wand makes it easy to store, and the handle reverses for right or left-handed people. The PJB-16 is made up of high-quality material, fit and finish. It seems to be to most sturdy and solid among the models in this list. I love products that will last throughout the years. There are several great things about the sprayer although it’s most distinctive feature is the walking speed indicator. I find consolation in the thought that I can do consistent work by walking at a steady speed. Thus, the indication becomes quite handy although I do wish could be louder. There’s one downside to the product though and that is the blue container can be hard to see so that mixing applications becomes tricky. You can’t see the levels as conveniently as you could with other high-end brands like Field King Professional. This is a fantastic choice for heavy duty sprays that require commercial solid work from commercial quality material. There are essential factors you must consider before choosing a backpack sprayer. These factors will help you determine the best type or model for your needs. You have to think about how often you would be using the backpack sprayer. Are you going to use regularly or will you be utilizing it only one a week or on a few occasions? 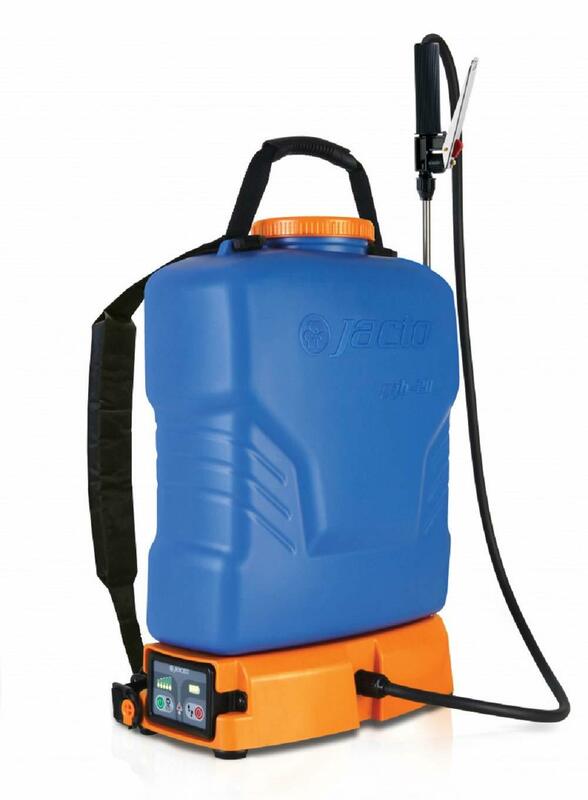 If you’re going to use it on a regular basis, then you need a sturdy brand like the Jacto PJB-16 Backpack Sprayer. The tank must be built from high-density material like polyethylene and capable of handling UV. And don’t omit any part in your inspection – from seals to hoses – they need to resist wear and tear and withstand constant exposure to the chemicals. Every backpack sprayer has a purpose and a number of them do a better job than the others. For instance, a type that works wonders with vegetables may not be suitable for woody plants. You must figure out the type of solution utilized in each tank to achieve the best results. For instance, diaphragm sprayers are generally more applicable to harsher chemicals compared to piston sprayers. Consider also the pressure requirements before choosing a brand. There’s no significant difference with it comes to benefits between a manual or motorized sprayer and it all depends on your preference. 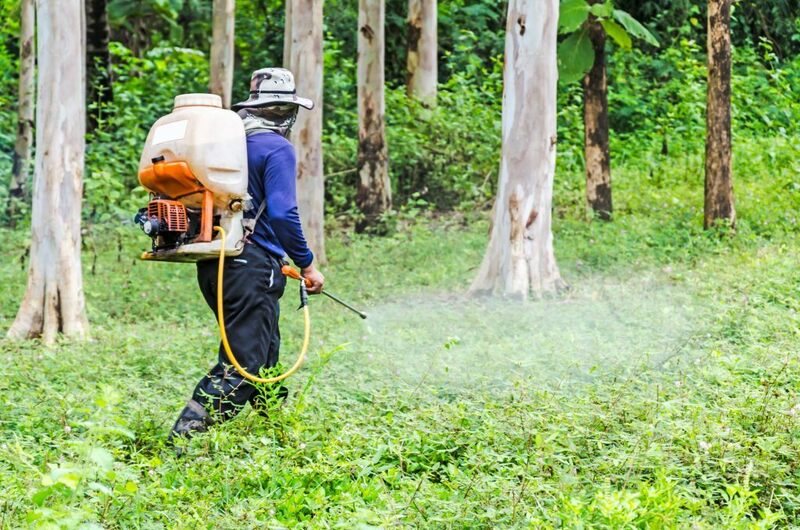 Generally speaking, motorized sprayers are great for larger land areas while manual sprayers are more applicable for foreign infestations. There are several types of lances that you can use to make sure your sprayer is safe and efficient. To eliminate any chemical leakages that may cause harm to the environment, select a spray wand that prevents leakage and is suited for your property. For better accuracy, make sure it’s compatible with the caps and nozzles of your sprayer. Calibrated with an output/minute, and walking speed is another crucial factor to consider. This is important to make sure you’re utilizing your tool as effectively as possible. Don’t forget to use water while calibrating your sprayer and don’t do it while the tank contains chemicals inside. Well known, high-end brands will always be manufactured from high-quality materials and contain guarantees and warranties if ever something goes wrong. Warranties mean that the company is confident with its product and that is obligated to deal with any problems you may encounter. Safety should always be the first, especially when it comes to a backpack sprayer. Opt for sprayers with ergonomically designed tanks and extra padded straps for more comfort. Pump handles and wand grips will help soothe your tired hands and make sprayers much easier to use. Even though every knapsack sprayer comes with its own special features, the majority of them will have the same basic components. These consists of the wand, pump, tank and spray attachment. The tank contains liquid pesticides and that makes them the heaviest parts. The lance or wand, if long enough, helps provide more stream spray control to the operator. If you have to fertilize your lawn or garden or require pest control on your fruit trees, then the D.B. Smith’s Field King Professional Backpack Sprayer is our top recommendation and it will aid you to finish your gardening job quickly and easily. Depending on your needs, you may pick one or several among the brands on our list. For sure, the other brands would also serve you well, even though they are not our top recommendation.